The analysis of the latest data from the Juno probe, published in March of 2018, will help answer that question. The scientific papers also help understand what lies beyond Jupiter's thick envelope of gases and whether there is a nucleus that was formed from rock, which could help astronomers answer one of the biggest mysteries about the origin of the Solar System. According to the latest mission reports and a series of scientific studies, NASA's probe observes huge storms, detected winds more than 3,000 kilometers below the clouds that cover its atmosphere and details about an almost unknown nucleus. Jupiter has the shortest days of all the planets in our Solar System. Since Jupiter is a gas planet, it does not rotate as a solid sphere. Jupiter's equator rotates a bit faster than its polar regions at a speed of 28,273 miles/hour (about 43,000 kilometers/hour). This makes the Gas Giant the fastest spinning planet in our Solar System rotating on average once in just under 10 hours. With these characteristics, its gravitational field should be uniform, but for some reason, it is not, there are areas where the giant's pull is greater, and until now researchers had no idea why. This composite image, derived from data collected by the Jovian Infrared Auroral Mapper (JIRAM) instrument aboard NASA's Juno mission to Jupiter, shows the central cyclone at the planet's north pole and the eight cyclones that encircle it. 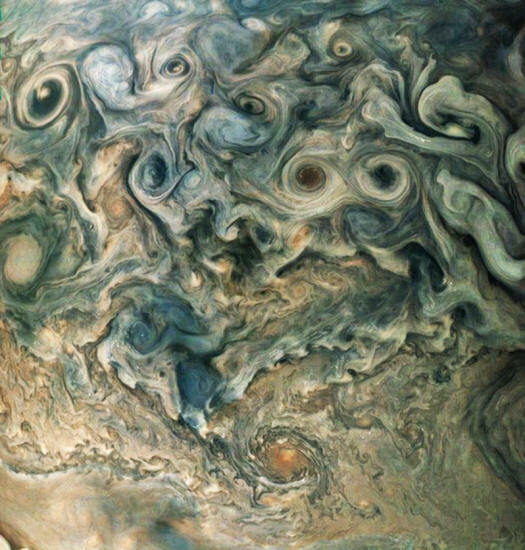 Scientists analyzed data obtained by NASA's Juno probe and have found that 'odd Gravity and rapid jest streatms lie around 3,000 kilometers below the surface of the clouds that cover the planet. Furthermore, experts have found that at each pole on Jupiter exists a cyclone which is thousands of miles in diameter. The study also explains how these cyclones appear to be surrounded by a polygonal arrangement of storms - eight in the north and five in the south. 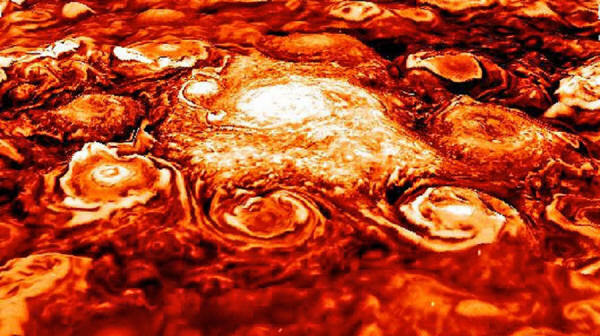 "Before Juno, we had no idea what the weather was like near Jupiter's poles. Now, we have been able to observe the polar weather up-close every two months," said Alberto Adriani, Juno co-investigator from the Institute for Space Astrophysics and Planetology, Rome, and lead author of the paper. "Each one of the northern cyclones is almost as wide as the distance between Naples, Italy and New York City - and the southern ones are even larger than that. They have very violent winds, reaching, in some cases, speeds as great as 220 mph (350 kph). Finally, and perhaps most remarkably, they are very close together and enduring. There is nothing else like it that we know of in the solar system." The discoveries reveal unprecedented details about Jupiter's interior and could help experts finally understand the dynamics that exist inside the gas giant's atmosphere and other similar planets across the galaxy. 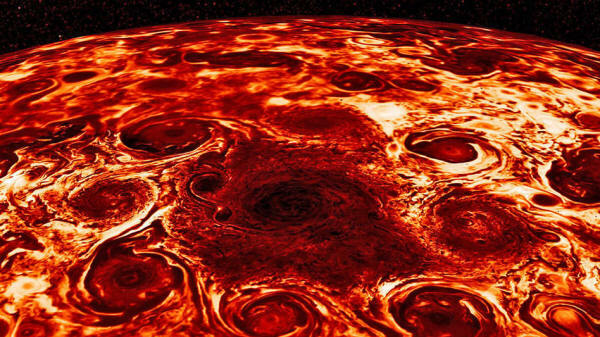 "These astonishing science results are yet another example of Jupiter's curve balls and a testimony to the value of exploring the unknown from a new perspective with next-generation instruments. Juno's unique orbit and evolutionary high-precision radio science and infrared technologies enabled these paradigm-shifting discoveries," said Scott Bolton, principal investigator of Juno from the Southwest Research Institute, San Antonio. "Juno is only about one third the way through its primary mission, and already we are seeing the beginnings of a new Jupiter." "Galileo observed the stripes on the Gas Giant more than 400 years ago," said Yohai Kaspi, Juno co-investigator from the Weizmann Institute of Science, Rehovot, Israel, and lead author of a Nature paper on Jupiter's deep weather layer. "Until now, we only had a superficial understanding of them and have been able to relate these stripes to cloud features along Jupiter's jets. Now, following Juno's gravity measurements, we understand how deep the jets extend and what their structure is beneath the visible clouds. We are basically going from a 2-D picture to a 3-D version in high definition." The result was a huge surprise for the Juno mission scientists because it indicated that the weather layer of Jupiter was more massive, extending much deeper than previously thought. The Jovian weather layer, from its very top to a depth of 1,900 miles (3,000 kilometers), contains about one percent of Jupiter's mass, which is approximately 3 Earth masses. "By contrast, Earth's atmosphere is less than one-millionth of the total mass of Earth," said Kaspi. "The fact that Jupiter has such a massive region rotating in separate east-west bands is a surprise." In addition, the gravity signature of the jets is entangled with the gravity signal of Jupiter's core.